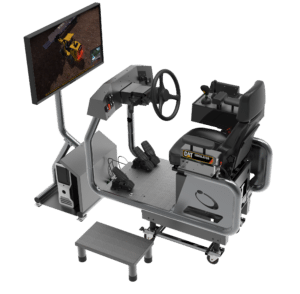 Cat Simulator training provides a way for operators to gain familiarization and understanding of machine controls, and learn proper operating procedures before training on actual machines. 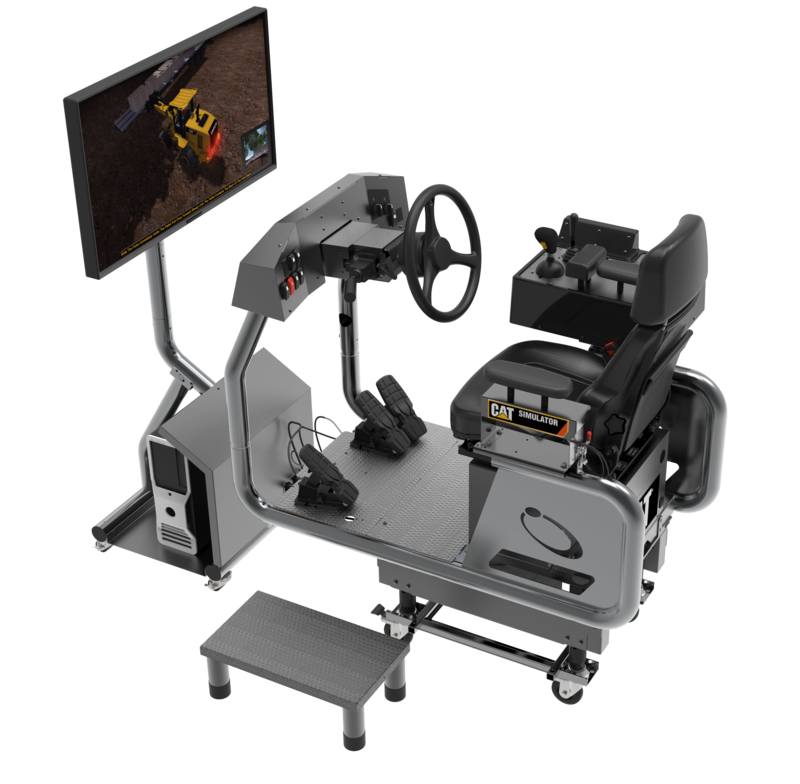 Small Wheel Loader Simulator training is set in a construction environment in both day and night settings. The Cat Simulators Small Wheel Loader system features authentic controls combined with simulated applications, including the forks work tool attachment. The Small Wheel Loader teaches Controls Familiarization, how to perform a Machine Walkaround, Driving, Hauling, Loading and Carrying, Stockpiling, Truck Loading, Truck Spotting, Backfilling with the commercial and multipurpose buckets, Carrying Objects with the multipurpose bucket, Quick Coupler operation, Unloading Pallets with the Forks work tool and a special Open Training mode. Hardware – Frame and controls needed to operate the simulator, computer, mouse, keyboard, seat, one monitor stand and choice of one or three 43″ front monitors. Software – Small Wheel Loader Simulator software and SimU Campus Training Records Management software. Languages supported in the software include English, Spanish, Portuguese, French and Chinese. The Small Wheel Loader Simulator System comes with exclusive companion training material for the iPad. An interactive eBook expands simulator training for classroom or self-study. Topics include safety, maintenance, application methods, video examples, operation tips, how-to images, formulas and more. Motion system. Allows users to feel vibration and movement when the simulated machine is running during training exercises. Rolling platform. Allows easy transportation and movement of the simulator.